The Lazy Harvest: Start Saving Water and Money in Just a Few Hours. Home /Ecology/The Lazy Harvest: Start Saving Water and Money in Just a Few Hours. Want a quick but very useful and effective homesteading project you can knock-out this weekend? Consider installing a rain-harvesting system. 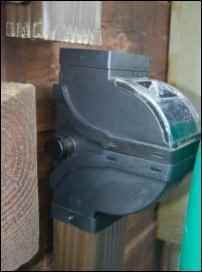 A diverter runs about $35.00 and in less than hour, you can have a supplemental system for your water needs. It may be the only source of water: We’ve all heard that you can only survive for three days without water. In some arid or island regions, rain collection might be the only source of potable water. In Tucson, Arizona, the water table has dropped 300 feet in the past 100 years and the water is becoming more saline. Ninety percent of the fresh waterways are gone. For others, rain barrels might be the only source of water during an emergency, such as a long power outage. When the electricity goes out, our well pump goes with it (the well is too deep for a hand pump); we have stored some water, but our rain barrels provide an additional source. Saves money: You’ll be saving on your water and/or electric bill and that’s always a plus. Rainwater is low in minerals, making it ideal for laundry, car and dish washing, and bathing. Its lack of chlorine also makes it ideal for ponds and sensitive plants. A British study found that new homes with underground tanks were able to reduce their consumption of mains water by 50%. Protects house and landscaping: Rain harvesting helps to control storm-water, which in turn helps to prevent soil erosion, leaky basements, foundation issues, and overtaxed sewers. Furthermore, collected rainwater can still be used during water bans, allowing you to protect landscaping investments in drought conditions. Protects local and regional environment: Making use of rainwater helps to reduce the amount of water extracted from local rivers, waterways, and water tables. In turn, ecosystems remain healthy and viable if water levels remain adequate. Local governments are starting to understand this; Portland and Seattle have begun to encourage rain harvesting in order to protect salmon populations and Maryland is working to protect the Chesapeake Bay. There are two main ways to collect rainwater on your property: earthworks and man-made systems such as barrels. Rainwater expert, Brad Lancaster, offers eight principles to consider when planning for water management. 1. Observe how water flows on your property. Are there places where the water flows swiftly, causing erosion problems? Are there places where the water gathers, keeping the soil saturated? Are there places where it would be easy to collect water? 2. Start at the high point of your property (obviously, water flows down). For most of us, this would be our roof but it could be anything from hills, banks, or our neighbor’s overhanging trees. Where does the water flow as it journeys down your property? How close to “the top” can you begin catching the water? 3. Start small and simple. With rain harvesting, it’s good to use lots of different “systems” and tools. Keep things doable and repairable. Have back-up systems for your back-up systems. 4. Spread and infiltrate the flow of water. Keep the water on your property for as long as possible; collect it and allow it to sink into the soil. 5. Plan for, and make use of, the overflow. If you’re in a dry area, you’re going to have sudden, strong thunderstorms. If you’re in a wet climate, you’re going to have long periods of rain where the soil will become too saturated and the rain will run-off. In both cases, you need to plan for this overflow and find ways to utilize it. 6. Avoid bare soil. Use ground covers, which act as sponges and give the soil time to absorb the water. 7. Maximize beneficial relationships and efficiency in your system. Systems can do more than just collect water. For instance, you might build a rain garden in a naturally soggy place on your property; this might eventually evolve into a small pond that could hold some fish. Or consider planting water-hungry plants around your rain barrel; they can catch any drips from the spigot and you’ll be better able to keep up with their water needs instead of finding them shriveled up in the noonday heat. 8. Continually reassess your system. Are there more ways you can utilize the rainwater? Are you dealing with overflow properly? Are there plants you could move that could make use of your rain collection? The first method to consider for collecting rainwater is through the use of earthworks: rain gardens, basins, swales, berms, drains, terraces, and check dams. Rain gardens are becoming more common in public areas like grocery stores, parks, and within traffic circles and are simply shallow depressions that are planted with deep rooted (preferably native) plants and that collect rainwater. These gardens reduce damage from storm-water, filter pollution from the water before it reaches the underground streams, and provide a habitat for wildlife. Like the rain garden, a basin or swale, is a low area used to collect rainwater and reduce erosion and flooding. Oftentimes, moisture-loving plants are placed within and are naturally watered. What’s the difference between the two? A basin is a bowl-like structure and a swale is usually longer and follows the contour of the land. A basin can be very useful in allowing the water to “sit” long enough for it to infiltrate the soil. A swale can be very effective in diverting water away from places such as the foundation of buildings. For practicality, basins and swales are often surrounded by berms, a raised mound of soil, which can be used as pathways and/or planting beds for plants that like drier roots. Other earthworks to consider incorporating into your water management system are terraces, French drains, and check dams. Most of us are familiar with the rice terraces of Asia but even small-scale use of terraces can allow some of us mountain-folk to make greater use of our land. For more examples of an incredible use of terraces in mountain regions, check out the Austrian farmer, Sepp Holzer. Finally, a French drain (a trench filled with rock or gravel) and check dams (low, pervious dams) can be used to reroute or slow down water paths on your property. Now on to man-made systems. 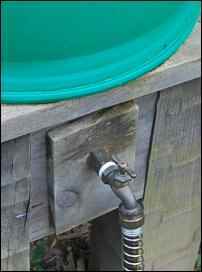 There are some simple tools that can help you to immediately make use of rainwater. There is the Rain Saucer, which looks like an upside-down umbrella that funnels water into a barrel. There is also the Groasis Box, which catches water, prevents evaporation, and protects young plants— allowing for greater growing options in arid places. But for most of us, installing rain barrels and cisterns are going to be the most effective options. I’ll be covering rain barrel installation, since this is the cheapest and quickest. Before setting up your barrel, check into local regulations. In places like Utah and Colorado, collecting rainwater is illegal because it violates water rights; however, Colorado is relaxing the regulations since a study found that 97% of precipitation doesn’t get to streams, regardless if it’s being collected or not. On the other hand, places like Texas offer tax incentives for water-catchment equipment and Tucson, Arizona is requiring all new dwellings to have a rainwater harvesting system. Your next consideration is how large of a system is needed. The average American uses 70 gallons of water, per person, per day. With modern appliances and by repairing leaks, that number can drop to 50 gallons. A useful formula is as follows: collectable rain water gallons = .05 X rainfall inches X area (square feet). Generally speaking, the western states annually receive 5-15 gallons per square foot of roof, the central states, 20-40, and the eastern states, 3-50. So, for instance, a person living in the east would need 500 square feet of roof and 1,000 gallons of storage space whereas a person in the west would need 1,000 square feet of roof and 4,000 gallons of storage. If you’re looking to just supply your garden’s watering needs, there is another useful formula: dry climate plants = 0.3 X area; temperate climate plants (such as vegetables) = 0.6 X area; and wet climate plants = 0.9 X area. For example, a 10 foot by 10 foot vegetable garden in an eastern state would need about 60 gallons of water per week (0.6 X 100 square feet); this could be supplied by a small roof and a few barrels. Unfortunately, these calculations are complicated by the fact that the western states generally receive their rainfall in the winter and the central states receive most of their rainfall in the summer. The eastern states are lucky to receive an evenly distributed rainfall. Rain collection systems often make use of three types of filters: sediment filter, activated carbon cartridges, and UV sterilizers. The sediment filters are usually screened filter baskets that remove large solids. Carbon cartridges can remove organic matter and prevent discoloration and odors. Finally, UV sterilizers contain a UV-emitting lamp that kills microorganisms so that the water is drinkable. However, it requires more maintenance as the mineral deposits build up. Our particular location in the Appalachians receives nearly 80 inches of rain annually and we have a well, so our purpose in installing rain barrels was to reduce electricity costs from having to run the well pump and to have a back-up water system in case we have a power outage (which is pretty common around here). We chose the Fiskars DiverterPro because it has a built-in automatic overflow; once the barrel is full, the water is diverted back into the downspout. We also like that it is a totally closed system so we don’t have to worry about things such as mosquito larva. It does have a filter, which rarely requires cleaning. This provides for the water needs of our garden and livestock and then some. However, if we did need to drink the water, we have a DIY water filter with a Berkey purifier or we could boil it on the woodstove, the regular stove, or in the solar oven. We got our barrels free from a local company that makes herbal tinctures. I have also seen them available on freecycle.org. 1. 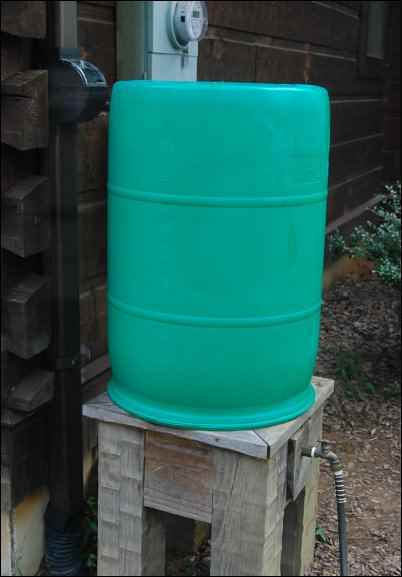 The rain barrel should be level and on solid ground or a stand. 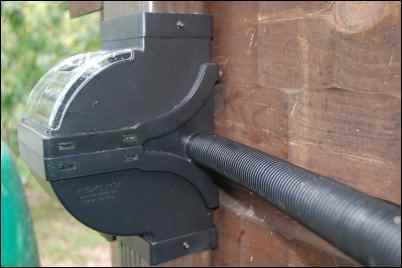 The tubing from the downspout must enter the barrel in a straight horizontal line. 2. 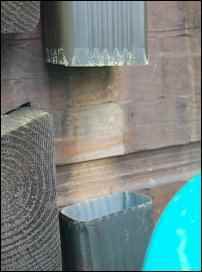 Place a level from the the top of the barrel to the downspout and draw a line on the downspout along the bottom of the level. 3. Make a second mark 2.25 inches above the first mark. Make a third mark 3.5 inches below the first mark. There should be 10.25 inches between mark two and mark three. Cut through the downspout at mark two and mark three. Downspout now has a 10.25 inch cut. 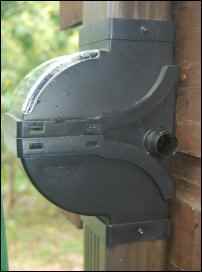 The diverter is placed on the bottom part of the downspout. 4. Remove the piece of downspout. Connect the diverter on the bottom piece of the downspout then connect the diverter to the top piece of the downspout. Diverter is now installed; you can see the hose connector at the side. Hose is now connected to diverter and running to the barrel. Make it as straight across as possible. 5. Because we were using a repurposed barrel, we had to drill a hole to accommodate the hose connector. The hole should be drilled in line with the hose connector on the diverter. 6. In order to secure the hose connector for the barrel, it was necessary to fish the hose connector nut through one of the threaded openings at the bottom of the barrel. We passed a string through the hose connector and barrel hole and out to the bottom of the barrel, through the threaded cap. Hose connector on the barrel. 7. We then passed the string through the nut and tied it to a washer that was larger than the nut. Next, the nut and washer were pulled up to the threaded portion of the hose connector inside the barrel. The washer enabled us to keep the nut tight against the inside of the barrel so we could tighten the nut by turning the hose connector. 8. Next, cut the connecting tube to the length needed. Connect the tube to the hose connector on the diverter and to the hose connector on the barrel. 9. Finally, thread a 3/4-inch pipe into the hole in the threaded cap and connect the spigot to the pipe. 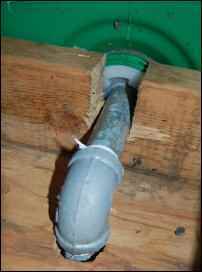 You can thread an elbow and another length of pipe onto the first pipe and then attach the spigot. Pipe coming out of the threaded cap of the barrel and going to the spigot. Pipe coming out from bottom of the barrel. We all have so many projects on our to-do lists but installing some rain barrels is a project you can check-off pretty quickly. There are many benefits that come with this project: having an emergency water source, saving money, making gardening easier, just to name a few. So add this to your list and then sit back and enjoy the next rainstorm.